New and re-stocked items freshly arrived in store and online here. Our Easter hours are: Friday (closed); Saturday (open 10-5); Sunday (closed); Monday (open 10-4). 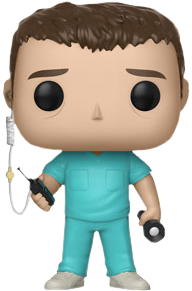 Straight from The Upside Down comes Funko's new Bob in Scrubs Pop! Vinyl Figure from Netflix's hit series Stranger Things! Just like the first season, Season Two is set in Hawkins, except this time it's the fall of 1984. Our favourites are all trying to move on with their lives after the events of the year prior, however when supernatural forces once again begin to surface, it's up to Mike, Eleven and the gang to stop it before it's too late! This Pop! features the loveable Bob (played by Sean Astin), wearing his scrubs. An absolute must for any Funko collection. ©2008-2019 Retrospace. All rights reserved. Made by Cactuslab.